I was busy thinking about my New Year's menu and caviar struck me as a good idea for accompanying champagne. The aspic part of this recipe didn't really register in my head until I started to write the shopping list... unflavored gelatin? I remember ASPIC. It was on the party table when I was a kid somewhere between the port wine cheese rolled in walnuts, and the French onion soup mix dip. You made it in something that looked like this... that you always thought was just decoration in Aunt Mary's kitchen. It would come out looking like this. Yes, those were frightening culinary times that I am thankful that I was too young to fully comprehend how awful the food was before chardonnay, sundried tomatoes and brie awakened our tastebuds in the 1980's. Was Dorie having a flashback when she included this recipe? Maybe it was intended to be retro-chic, but it did not go over well at my party. The first thing a guest said was, "ASPIC my grandmother was a cooking instructor in the 1950's and she was mad about ASPIC..." as she giggled and sampled the smoked salmon instead. Granted, I did not make the recipe the way Dorie explained it. I wanted a mold to leave out at a party, not an appetizer for a sit down meal. I had to use fish stock because I have never seen fish bouillon in any of the grocery stores I visit... not that would matter that much.. fishy broth is fishy broth. I added some color by putting lemon zest and dill, but I think that just broke up the salty fishy taste... I'm not really sure what would make this more appealing? The few guests that were willing to try it had it with a dab of cream cheese on a small bagel. OK,... but gelatin just doesn't seem to appeal to the 21 century palate. 1) Bring fish stock to a boil in a medium sauce pan and whisk gelatin powder into it. When it is dissolved remove the pan from the heat. 2) Add roe, lemon zest, and dill to the gelatin. 3) Pour into a small jello mold or mini loaf pan (non-stick). 4) Refrigerate for at least 3 hours. 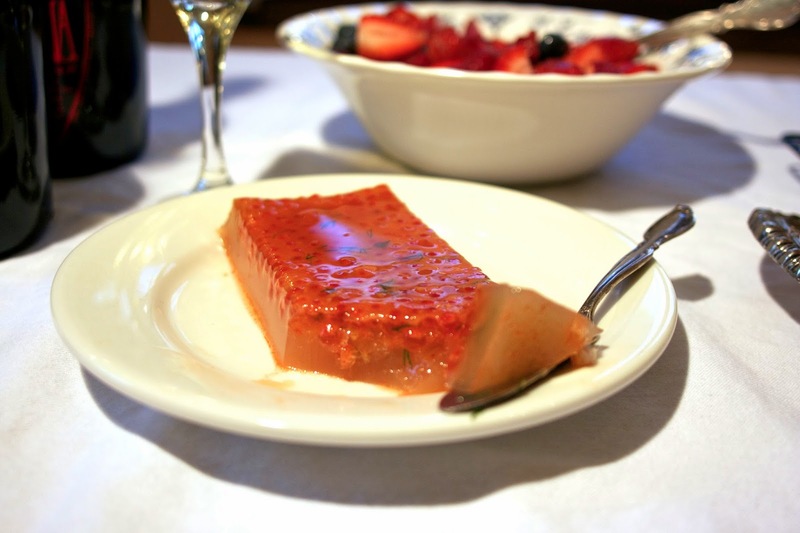 Loosen edges with a butter knife before flipping the aspic out of the mold. You were certainly a good sport--as were those daring guests willing to give this a taste! Yes, they were very kind. Champagne helped it go down better. Well, I figured if it was out on a table with a lot of other things it wouldn't be that big of a deal. It is something that should go well with champagne... which helped. 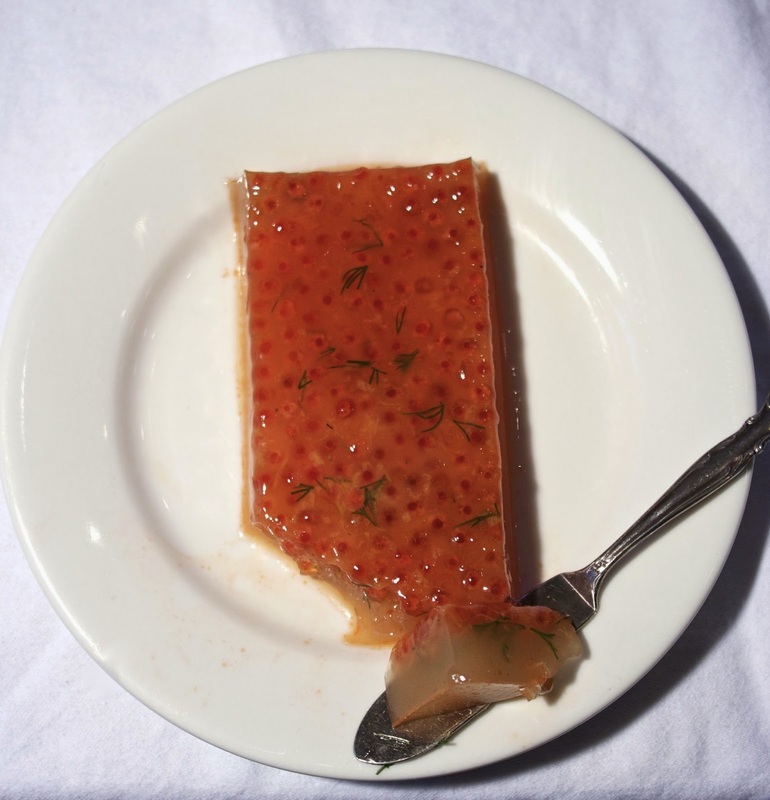 Wow, the photo of the fish aspic brought back memories! I just couldn’t go with fishy gelatin…you are a brave soul, Diane!! As were your guests! Yours does look lovely! Remember all those crazy aspic molds... My Aunt Mary had tons of them hanging in her kitchen. Uh huh, this one was interesting. Glad aspic has largely gone down as history. Diane, the terrine looks lovely! If only it tasted as good as it looks! 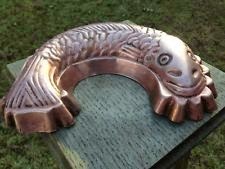 I remember those molds and my husband remarked at the datedness of the recipe when I told him what I was going to make. Sigh. Such an odd one, but I guess at least we tried it. Yes, we were all good sports...now why aspic was ever popular is still beyond me. 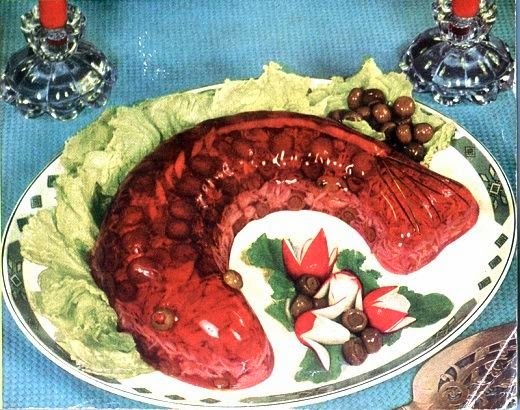 I like how your brave guests approached the aspic, combining it with other appetizers. At least it was quite the conversation starter! You are correct... conversation starter and finisher. Good for you. You committed yourself to Dorie and so did your guests. Very brave, Diane, to present this caviar in aspic dish to your guests who, I know, always expect something spectacular from you. Arman would be grateful because he sure is getting bonked on the head by the Dorista's this week. Since I didn't make it - the Simplest Breton Fish Stew was very good, I suspect, but don't know, if it was the fish gelatin that was just wrong on every level. 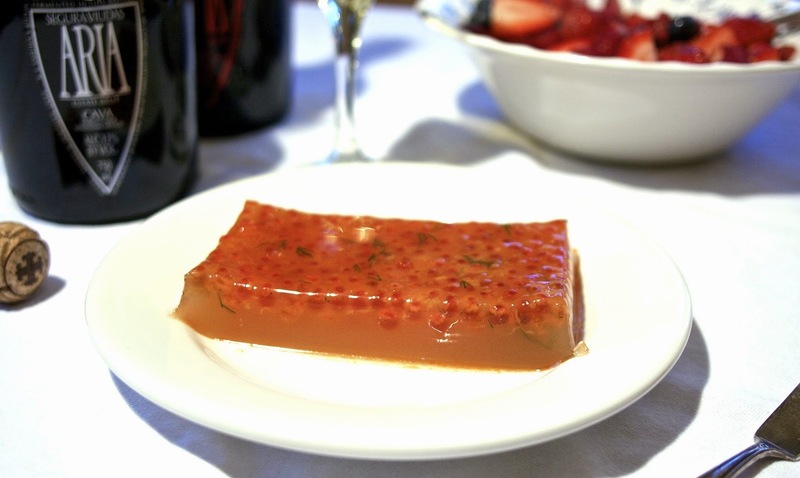 I like caviar but after reading all these comments, I am not going to waste it on this dish. Now, I would have loved having some of that fish! I really did make a go of this dish because I am a fish lover and caviar does go well with champagne, but I would agree don't bother. I was brave. but you are wise. My mom didn't own the molds, but my Aunt Mary next door had alls different animals hanging in her kitchen...strange times. I'm not sure I would have been brave enough to serve this to guests...but it sounds like you had plenty of other more palatable choices!